Come along to our AGM and film premiere on Tuesday 4th December! On Tuesday 4th December we will be holding our AGM followed by an exciting event including an exclusive film screening, performances and much more. Kindly hosted by HAVAS at 3 HKX Building, Pancras Square, we will start with our AGM from 7.30pm – 8pm followed by half an hour of drinks and light refreshments before we go into performances and conclude with networking finishing at 10pm. 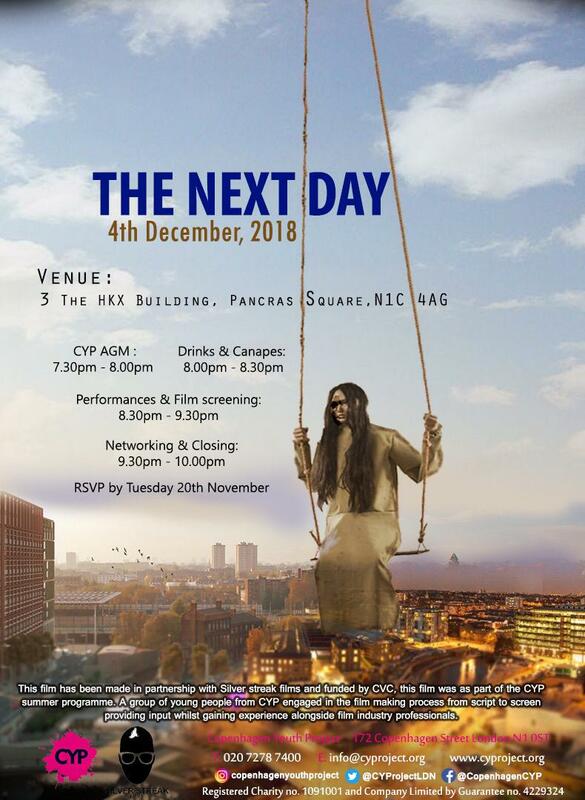 We understand that our AGM might not be for everyone so feel free to come along from 8pm onwards for an exclusive screening of ‘The Next Day’, a film created by a group of young people during our summer programme with the support of Silver Streak Films and funding from CVC. If you would like to attend please RSVP with your details and number of attendees to info@cyproject.org with the subject line ‘CYP AGM & Event’ by Wednesday 28th November.